It’s time for us to check up on stats outside of the King/Snohomish core with our “Around the Sound” statistics for Pierce, Kitsap, Thurston, Island, Skagit, and Whatcom counties. This month’s story in a nutshell: Supply growth slowed while sales strengthened a bit in King & Snohomish, but fell elsewhere. Next let’s take a look at median prices in June compared to a year earlier. Prices were up from a year ago across the board. Gains ranged from as low as 1 percent in Kitsap to as high as 13 percent in Snohomish. The number of listings grew year-over-year everywhere but Kitsap and Island counties. 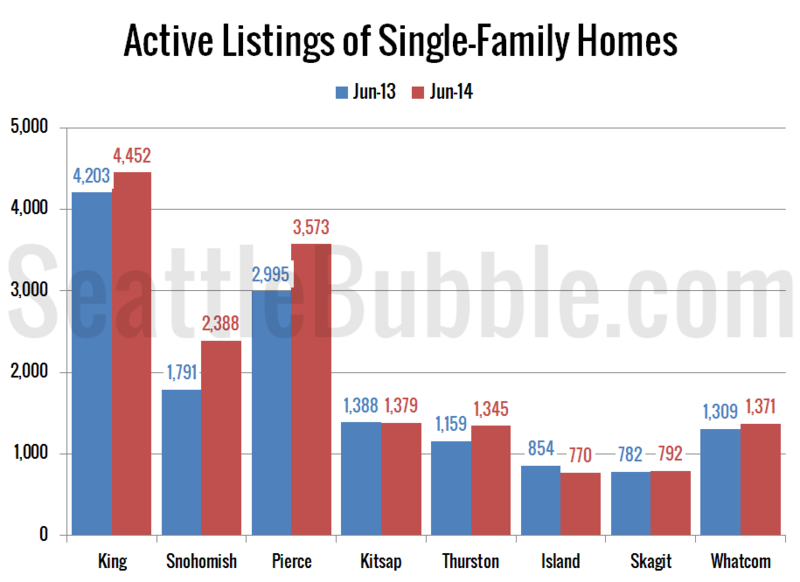 The biggest gainer by far was again Snohomish County at +33 percent, but Pierce and Thurston both also saw double-digit gains in inventory. Closed sales fell in June compared to a year earlier everywhere but King and Snohomish, which both saw gains just over two percent. 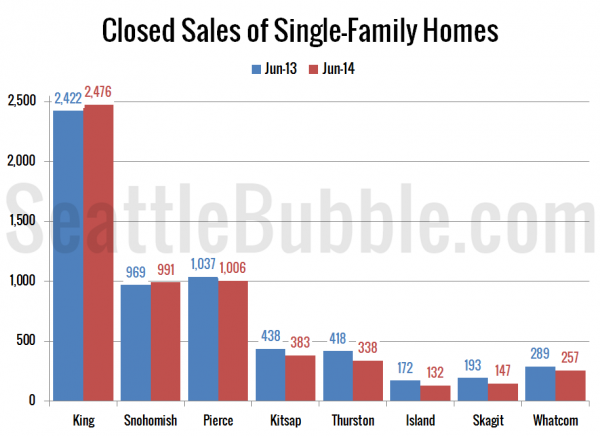 The biggest decline in sales were in Island and Skagit Counties, where sales fell over 23 percent from June 2013. 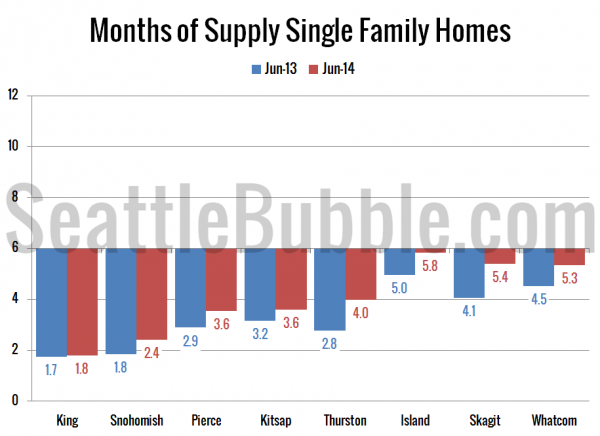 Here’s a chart showing months of supply this June and last June. The market was more balanced than a year ago in every Puget Sound county, but they’re also all still in seller’s market territory. 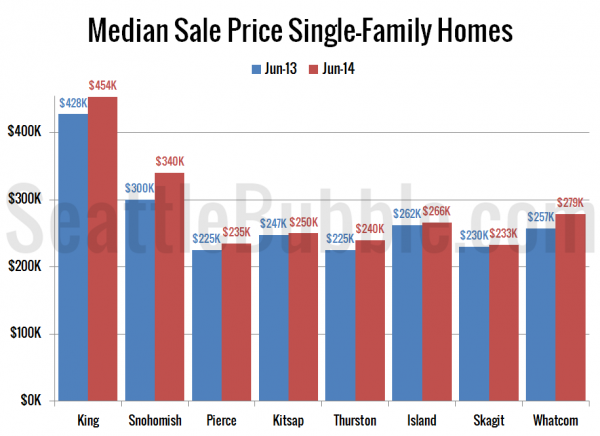 To close things out, here’s a chart comparing June’s median price to the peak price in each county. Everybody is still down from the peak, with drops ranging between 6 percent (King) and 24 percent (Island). Still moving at a snail’s pace toward a more balanced market across most of the Sound. Fairly hefty price plummet, albeit the first chart [includes condos?] 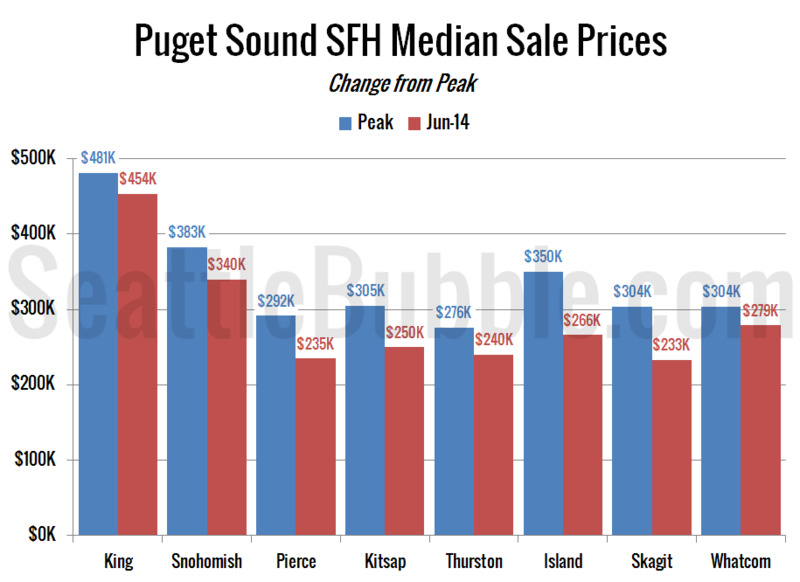 shows a King County sales price increase of [number cut off?]. RE: softwarengineer @ 1 – Oops sorry about the cut off chart. Fixed. You’re mis-reading the last chart. The blue bars in that one are the peak price reached in each county, not last year’s prices. I wonder when it peaked, during last winter’s bad rainy weather….LOL???? When Seattle area real estate had hit bottom in 2011 or 2012, people were saying it would be another twenty years before we’d see the 2007 peak prices again. Now, the King County median single family home price is about 5.6% below the 2007 peak. But in South King County, in places like Auburn, Kent, Tukwila, and Federal Way, we’re still down around 15%+ below the peak. Which suggests to me that in places like Greenlake or Kirkland, we’re at or above the peak. I’m not suggesting that we’re due for a crash or anything like that, but doesn’t it seem like we’ve gone up too fast too quickly? There will be a correction shortly in areas that have appreciated the most. I am starting to track it on a weekly basis. Will be hard to sort the seasonal change from the bubble deflating change, but am doing seasonal expectation percentages so we can see where the rate of change is lining up with normal seasonal expectation. Working on the baselines now, but expect a correction in areas that have had the highest levels of appreciation beginning in 2012. After a bidding war on 718 N 83rd St which allegedly attracted multiple 50K-over cash offers, I’m not holding my breath for a correction just yet. I think the rate of price increases will slow down to a more reasonable level around 3-5% increase per year, but a “price correction” anytime in the near future…. I think not. Incomes for the “seattle/eastside area home-buying class” are up over the last 5 years, and interest rates are in the low 3% range….prices in desirable areas still have upwards potential. RE: Christian Wathne @ 8 – I don’t understand your comment. You say near-record low rates are a reason why there is “upwards potential”. Would not the opposite be true? If today’s market existed in an environment with higher (read: non-manipulated) rates, I’d be more inclined to agree. Yes, I sure think so. But, the market can stay irrational… blah, blah, blah… you know the rest. I’ve been renting a year now since I sold my condo, would love to buy, but will wait for some kind of correction or just leave this area all together. There was a house in phinney ridge that sold for list price with only one offer last week. I have been looking for several years and that surprised me. We would have put an offer in if there were no other offers but it was at the top of our price range. This house had potential but was not turn key, as was the place on 83rd. It was also priced $40,000 higher. I can see what you mean…, but what I meant to emphasize when I wrote that “interest rates are in the low 3% range”, was that though prices are near (or above) peak prices, the affordability of a home is much better now than it was back in 2007 because of the low rates. You could be concerned about prices dropping if rates increased, but the fed has made it pretty clear that they intend to hold interest rates low for at least the next couple years. If the QEs keep buying 0% federal bonds and letting the banks lend it out for like 3-5% pure profit….the low volume stock market is the best place to invest [until it gets saturated with buyers]….ask Buffet. RE: softwarengineer @ 14 – Editorial: It is more than troubling to think that incompetent and criminal banks are allowed this privilege, illustrating again what a total joke the US financial system is. Get rid of the middlemen. Incomes are Up for the Home Buying Class? If you’re talking “skin in the game” worker bees; the high priced Seattle area is likely just like all the high priced “NewYork” coastal cities’ home owners. About half of ’em don’t work. They buy their home for excess change laying around and see nothing wrong with saturating the job market with P/T incomes, overpopulation and slave wages….don’t affect them.